Today I am going to show you how to make potato croquettes using the same perogie recipe that I shared on the blog not too long ago. I know a lot of people are planting their gardens these next couple of weeks but we are just getting started. Some people may well be ahead of us and have even finished depending on where they live in the world. We are hoping to finish our vegetable garden soon plus I’m excited to report that my hubby is making me a greenhouse this year for peppers, tomatoes and cucumbers. What I am most looking forward to is my potato crop. We did a small crop last year and it was great except for the ant nest that had found its way into my box. If you don’t want to use a box to plant potatoes Katrina shared an excellent post for planting potatoes in a pot. I really want a big crop to sustain us through to winter and even longer is it could. As long as you have a cool dark place to store your potatoes they can last quite a long time. I also want to make a lot of prepped food with these potatoes too like my perogies and the one I am going to tell you how to make today, potato croquettes stuffed with bacon and cheese. For the potato croquettes as I mentioned I’m using my perogie recipe however this time around I missed out the onions and added more bacon and a little more cheese. Take note that you don’t want to add too much cheese though or the potato croquettes will not hold together when you go to shallow fry/deep-fry them. The potato croquettes are great to use up some mashed potatoes after a big lunch and are great to freeze. When freezing the potato croquettes simply them in cornmeal without the egg. They are crunchy on the outside but ooze cheese and bacon on the inside. They will easily last in the freezer for about 3 months. I’m pretty sure you won’t have them waiting that long before they are eaten anyhow. You can also mix it up by adding other ingredients to the potato croquettes such as the addition of salmon, tuna and even turkey or chicken. These versatile potato croquettes are a great way to use up any leftovers in the fridge. If you like a dipping sauce for your potato croquettes you can use ketchup if you fancy that or a lovely Roasted Garlic Yogurt Dip or any dip you like. If you love potatoes like we do you will love these deep-fried potato croquettes stuffed with cheese and bacon. The perfect side-dish or pub style snack for a movie or game day. Whilst these are on cook bacon until crispy. If you are using bacon strips simply make sure they are cooked well then you can easily crush them into little pieces. When cooked drain on a piece of kitchen roll to ensure all fat is off bacon. Once potatoes are cooked drain and place back into pan. Then add cream, butter, salt and pepper. Mash potatoes until there are no lumps and it takes on a creamy texture. Now add bacon bits and cheese. Keep mixing ingredients until all the cheese has melted into the potato mixture. Let cool completely then place in the fridge for at least two hours. Now take at least a tablespoon of mixture and roll into an oblong shape. Mix together the flour and cornmeal then roll the potato mixture in this until it is completely covered. NOTE: if you are freezing these to use at another time, this is where you stop and place on a baking sheet to freeze, once frozen take of the tray and store in a freezer bag until needed. Will keep for 3 months. In one bowl whisk the two eggs and in another have your breadcrumbs. You can add herbs to this and seasoning if desired. Now start dipping your potato mixture into the egg then into the breadcrumbs ensuring that it's covered completely. Now gently place then into the oil for a round 10mins or until golden brown. Place on kitchen towel to drain. 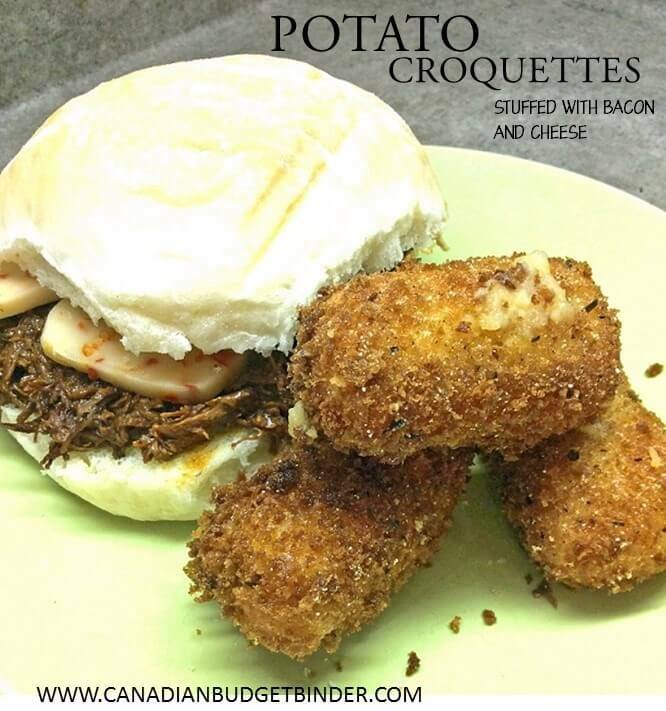 Whether you need a side-dish, a party snack for your summer back-yard gathering or for game day, movie night or hanging with the family these potato croquettes are always a hit! I am a fan of bacon and cheese like everything that has bacon and cheese would surely be my favorite. So this potato croquettes would perfectly suit my taste, Nicola. I hope I can cook this at home. The recipe looks delicious Nicola!!! I’m making grow bags from landscape fabric for my potatoes to try this year. I have 4 tomato plants growing in some now and they are doing very well! I figure to half fill the bags to plant and then fill them up more as the ptatoes grow. I have an ant nest around the roots of one of my yellow day lilies and the poor plant is not doing So well this year. I scattered some cream of wheat around the plant that hubby insisted I buy then didn’t eat around the plant and it seems to be doing a little better. I want to get some borax to mix with icing sugar for those little buggers too.